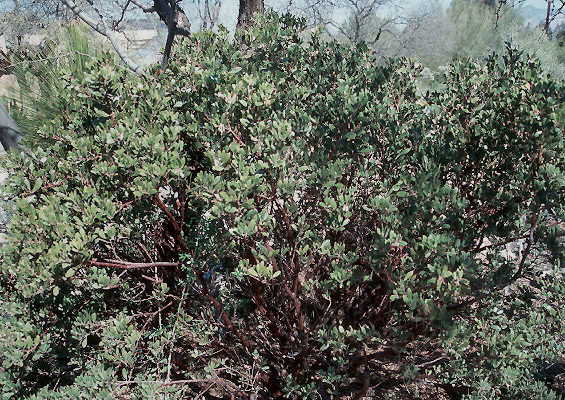 Evergreen shrub, 3-6 ft (0.9-1.8 m) tall, forms large clumps and thickets as branches often root when in contact with the soil. Trunks mahogany colored, exfoliating, but branches are covered with pubescence and having a yellow-green to grayish appearance. 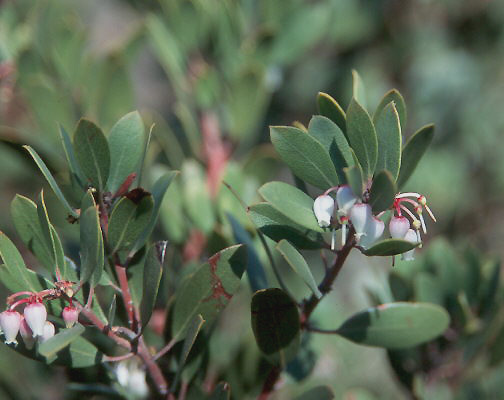 The branches are reddish, similar to those of Arctostaphylos patula (Green Manzanita). Leaves alternate, simple, erect, 2-4.5 cm long, elliptical to lanceolate, wedge-shaped base, pointed tip, entire margins, leathery, both surface are pale bluish-green due to a fine covering of hairs. Flowers white and pinkish, about 6 mm, urn-shaped, waxy, in dense clusters. Fruit 6 mm across, chestnut brown to terra cotta, shiny, flattened spheres. Sun, tolerates alkaline soils, sand, clay. Hardy to USDA Zone 5 Native range from Texas west to Utah, New Mexico, Arizona, and California, south in Mexico to Oaxaca.